ELDs have become a popular solution for businesses that prioritize monitoring safety, efficiency, and savings. They have also become a legal obligation for businesses in many cities. In the US, the ELD mandate has softly been enforced and Canada is next to join the party. Except it’s not so much a party, but more so a system used to electronically record a driver’s Record of Duty Status. So simply put, an ELD is an electronic logging device. Who Needs Electronic Logging Devices? So who cares? Well, if your business is required to fill Records of Duty logs and is operating in an ELD- mandated region you should care because you’ll need them. For example, ELDs are mandated in the US, Europe and other places as of this year. Some exemptions in the American FMCSA include infrequent Records of Duty (Businesses keeping a Record of Duty for 8 or less days in a 30 day period are exempt from ELD mandate), driveaway-towaway service, and pre-2000 vehicles as they are not compatible with ELD technology. Experts expect similar exemptions to be put in place for the Canadians. Canada is currently in the middle of putting an ELD mandate in place but the timeline has not yet been finalized. Therefore, if you are a Canadian, we recommend that you take a look at your regional transportation authority’s official website for an updated list. And then maybe stop for a Double Double at Tim Hortons. AOBRD vs ELD? Which Should You Use? If you’ve heard of AOBRDs, you must be a dinosaur by now because they are compliant with 1988 regulations and we are living in the future, people! 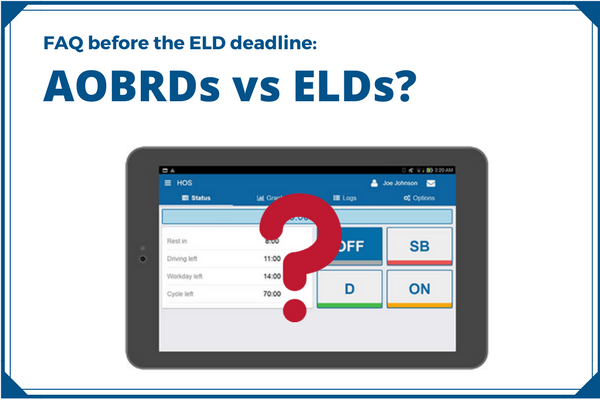 ELDs are compliant with modern mandates, AOBRDs, on the other hand, will have to be left behind as companies upgrade to ELD solutions in the future. With ELD, driving habits can be made safer and reduce the likelihood of accidents occurring. Things like speeding, harsh braking or acceleration, as well as distracted driving and optimized routes can be easily tracked by ELDs and help to monitor drivers. With ELDs, the need for drivers to fill in their logs by hand and have them faxed while they are on the road is eliminated. Everything is paperless. Did you know that 30% of fuel cost is influenced by driver behavior? With driver coaching features and optimizing the shortest routes, fuel efficiency is improved up to 12% while reducing the fuel usage by 18%. With better vehicle maintenance, downtime and any replacement costs are reduced to a minimum. 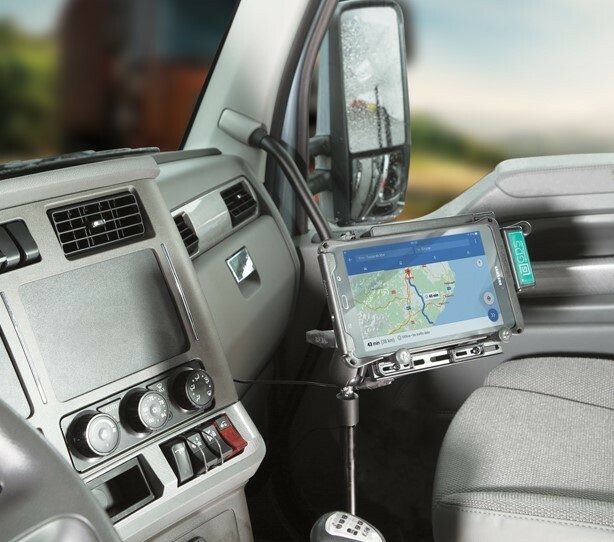 When it comes to discovering if ELDs are needed in any vehicle, the biggest factor is compliance. Generally, ELDs for Heavy Duty and Light Duty vehicles are the same but there are some minor differences. The biggest? Installation. You see, heavy-duty vehicles usually don’t have an OBDii port so they would have to opt for adaptors such as 9-pin cables. Most light-duty vehicles, on the other hand, are equipped with an OBDii connector port which an ELD device can then directly be connected to. If you are still unsure, feel free to reach out to GoFleet’s specialists and they can help you discover exactly what your options are. The Government Has 24/7 Access to Driver Logs. ELDs Does Not Improve Safety. FACT: Drivers are becoming more accepting of ELDs. Racking up unassigned driving logs and improperly editing hours. Some drivers sign out of their electronic logging devices and mark that driving time as unassigned, others may improperly edit their hours. However, ELDs can keep unassigned log records and inspection officers are often not impressed when they see this. 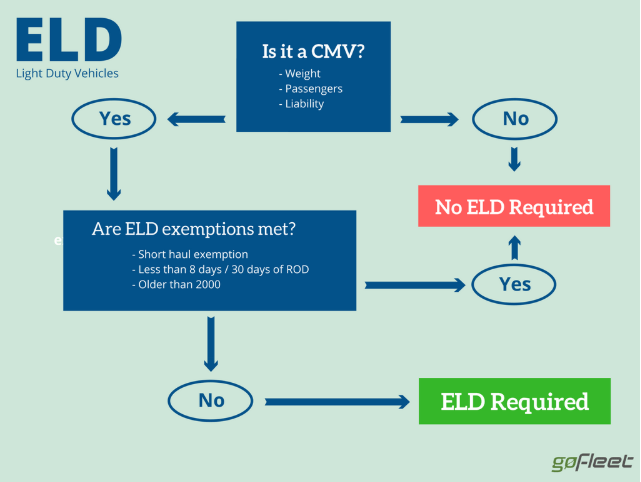 How to Choose an ELD Provider and Which ELD Device Should You Buy? Is the solution FMCSA Compliant? If not, stop looking. Without being compliant with the standards set out by the FMCSA, even with an e-log solution, you could still be at risk of fines. Even before getting into the features of the solution, take a look at the supplier’s experience and expertise with the FMCSA and ELDs. You want to work with a company that will be a long-term fit, and that usually means being able to adapt and integrate with other technologies as necessary. Does the supplier allow for 3rd party apps to be connected? With an open platform, you can easily integrate all your solutions, whether that be dispatching, accounting, or anything else, into an all-in-one solution platform for easier access and management. The FMCSA regulations are different in oil field operations, in Canada, and in Alaska. If your business also operates in these areas, ensure your supplier is able to meet those requirements to prevent downtime and keep your business in compliance. If you’d like to learn more, we encourage you to check out the following video to get a walkthrough of GoFleet’s HOS solution.